The mobile payments trend, undoubtedly, is on its way of becoming a mainstream phenomenon. It will change how society thinks about monetary transactions. In this issue we sum up the best social business case study and we analyze future opportunities around it. 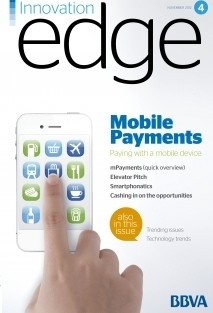 BBVA InnovationEdge' is the first corporate multiplatform magazine focused on innovation. Each edition featuresarticles, analysis and huge information about a particular theme. The mainpurpose of the magazine is to express the new trends and the upcomingtechnologies that may impact to the financial industry.